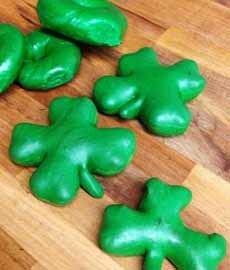 Green bagels are a novelty on St. Patrick’s Day. 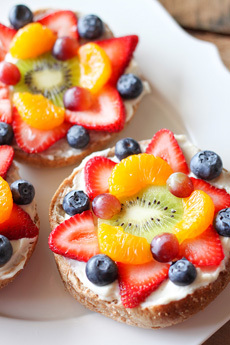 But here’s a more elegant way to enjoy your bagel, with green fruits and vegetables. The concept can be applied to any holiday or occasion with theme colors (see the lists below), and can be part of a bagel buffet for brunch. Bonus: It’s a way to add an extra helping of produce to your daily intake. 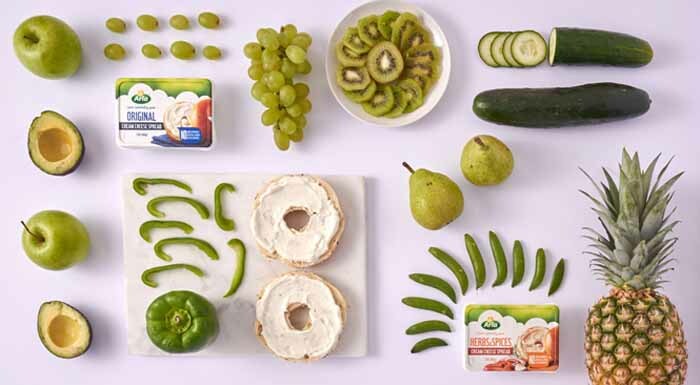 On top of the cream cheese, arrange fruits and/or vegetables in your color theme, as demonstrated by Arla Foods, maker of the cream cheese spreads used on the bagel (photo #1 and photo #6 at the bottom). Fruit on bagels beyond a raisin bagel? See photo #5, below—and try it on English muffins, too. Pick some fruits and/or vegetables from your color list, and get started. The green group has the most options. and  The alternative solution from Arla Foods. 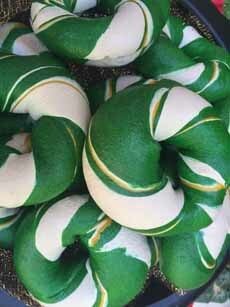 Conventional green bagels from Einstein Bros Bagels. Fancy (and $6 each!) at the Wynn Las Vegas. 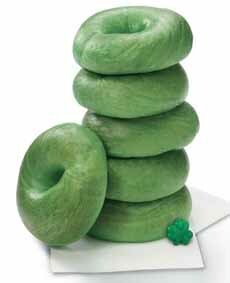 The creativity award goes to the shamrock bagels at Sunrise Bagels and Cafe in Wyckoff, New Jersey. Fruit-topped bagel from Number 2 Pencil. 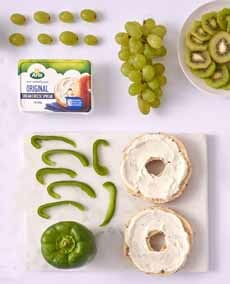 Bagels with a buffet of green fruits and vegetables (photo courtesy Arla Foods).